A former Methacton High School baseball star has been kicked off the Bloomsburg University baseball team for an offensive tweet about Little League star Mo'ne Davis, Sports Illustrated reports. We take matter very seriously; addressed the issue with the student-athlete (who has been dismissed from team), coach, and the team. 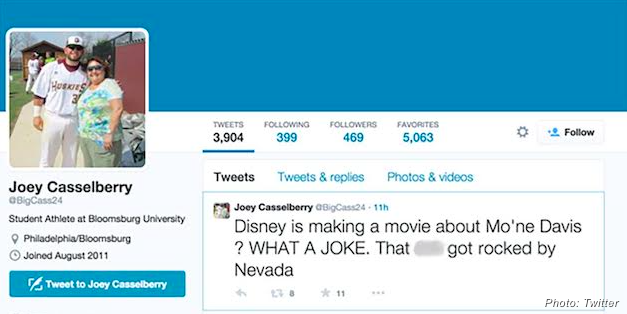 It is not clear when Casselberry posted the tweet. The Bloomsburg baseball media guide shows the 5-8, 230-pound first basemen had a career .305 batting average in 90 plate appearances. A video on YouTube shows Casselberry on the field for Methacton.